The restaurant regularly hosts wine dinners, special gathers, and holiday events. 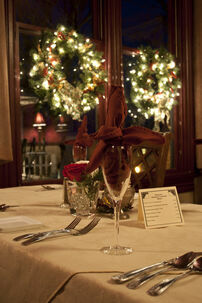 We are also open for Thanksgiving dinner, New Year's Eve, and Valentine's Day with special menus available. For private parties please email us or call at 541-488-1113. Celebrate the holidays with this special six course feast. Santa, Scrooge, and the Winchester Singers will all be there to fill your evening with songs, gifts and Bah Humbugs. Please arrive by 6:15 PM, the Feast begins at 6:30 PM. Reservations are required. 5% discount for groups of 12 or more that book for the first seven days of December! Dinner Overnight Packages start at $270 and include full breakfast.